Can you get the balls to the top? 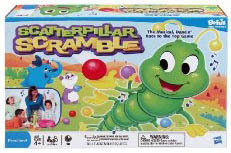 Scatterpillar wiggle and dances to the music in this fun race of fast-paced marble placing. Put your marbles on his row of hands in front of you. Race to place your colored balls from the bottom row up to the top row to win. The first player to set all eight marbles in Scatterpillar's hands wins. The caterpillar is constantly dancing and grooving.